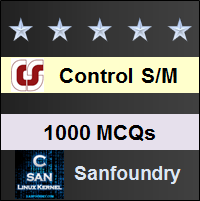 This set of Control Systems Multiple Choice Questions & Answers (MCQs) focuses on “Time Domain Analysis”. Explanation: Type is defined as the number of poles at origin and order is defined as the total number of poles and this is calculated with the help of the transfer function from the above transfer function the type is 1 and order is 2. Explanation: Since both the systems that is the first order systems are cascaded non-interactively, the overall unit step response will be critically damped. Explanation: As order of the system increases the system approaches more towards the ideal characteristics and if the third order system is approximated to an equivalent second order system then the rise time of this will be smaller than the original system for any input. Explanation: For a single pole at origin the system is of type 1 and impulse response of the system with single pole at the origin will be constant. Explanation: The error will be the steady state error if the period of observation is large as the time if large then the final value theorem can be directly applied. 6. When the unit step response of a unity feedback control system having forward path transfer function G (s) =80/s(s+18)? Explanation: The open loop transfer function is first converted into the closed loop as unity feedback is used and then value of damping factor is calculated. Explanation: Sensitivity is defined as the change in the output with respect to the change in the input and due to negative feedback reduces by a factor of 1/ (1+GH). Explanation: An underdamped second order system is the system which has damping factor less than unity and with negative damping will have the roots on the right hand side of complex plane as complex conjugates. 9. Given a unity feedback system with G (s) =K/ s (s+4). What is the value of K for a damping ratio of 0.5? Explanation: Comparing the equation with the standard characteristic equation gives the value of damping factor, natural frequency and value of gain K.
10. How can the steady state error can be reduced? Explanation: Steady state error is the error as it is the difference between the final output and the desired output and by increasing the input the steady state error reduces as it depends upon both the states and input.